We dived in the “bottle ship” near Great Basses light house. This has been a ship that was carrying soda bottles to Sri Lanka in late 19th century. Fragments of glass bottles still can be seen in the site. The two anchors are clearly visible. We did a drift dive along the reef afterwards, with the help of the current. The highlight of the day, was a shoal of over 10 dolphins that kept circling around our boat. We could dive in the famous “coin ship” where Arthur C.Clarke & Mike Wilson found bundles of silver coins in 1960’s. Located on the south of the light house, the site lies hidden, hence can be accessed only by diving between the openings of the reef. The currents are quite strong and one has to cling on to the rocks to prevent himself being tossed up and about. A canon and the anchor of the ship can be identified among the other debris. 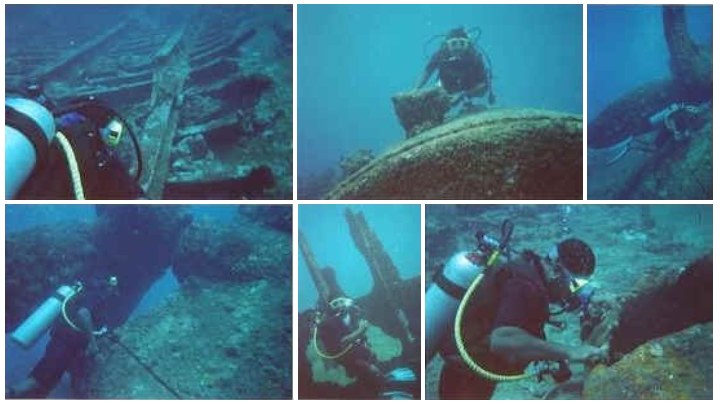 Great Basses Reef, located in the South East of the island, off the coast of Kirinda, is famous for it’s shipwrecks. It’s about half an hour boat ride from Kirinda fisheries harbour. 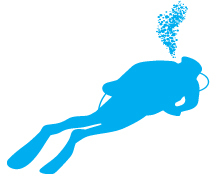 Due to strong currents and rough sea conditions, diving can be done only in the month of April, when the North East monsoons end and South West monsoons are about to start. 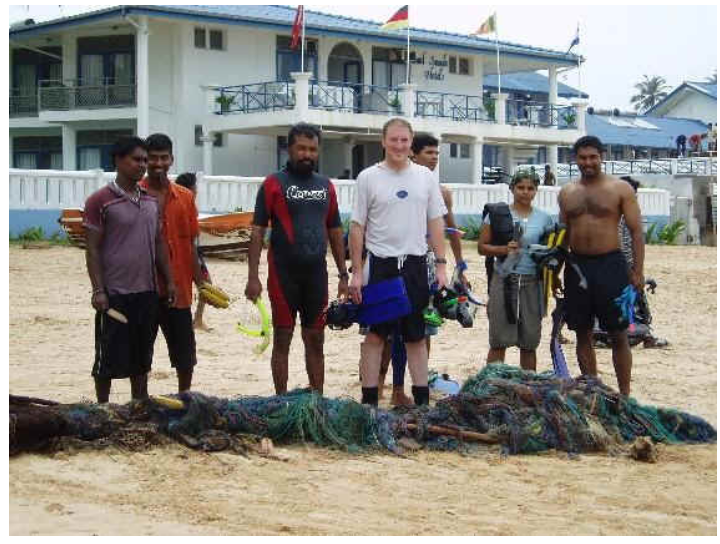 International Diving School facilitated the reef cleanup program initiated by Sri Lanka Sub Aqua Club and IUCN (World Conservation Union) with the help of volunteers. The main purpose was to remove the fishing nets entangled on the reef. This exercise was rather difficult due to the prevailing rough sea condition, however Somey and Marten Meynell of IUCN, both past commercial divers, managed to cut one fishing net and float it using make-shift airbags, and snorkelers removed it to the boat. The debris scattered in the shallow water was also removed by volunteers, and disposed. It was highlighted by Somey that, further cleanup programs need to be carried out, as when the monsoon starts and sea becomes rough, the debris buried in the sand will not be noticeable. Hence it was decided to carry out further beach and reef cleanup in near future. We started back our operations today. The hotel is re-building the diving center, so we were given a room to operate for the time being. Filling the tanks is done at Somey’s home. Not having sufficient diving gear is the problem, but we can manage. Some of our guests were kind enough to donate some used equipment, and some left their own diving gear for us to use for the time being. Not many divers, but we need to keep things going. We’d like to thank every one who helped us during these days. So sorry if we could not write to any of you individually, or respond to your e-mails, but we will always remember how our dear customers and friends were with us during the worst disaster our country had experienced. We dived in Godagala, Coral Garden Cave and Hikkaduwa Gala. The tsunami has not caused any damage to any of the dive sites. Today, Somey snorkeled around the coral reef. No damage done to the corals, except a lot of debris scattered in the area. Fishing nets were entangled in corals, so they need to be removed carefully. We started to salvage whatever was there at the diving center, though not much was left. Today Somey managed to get down some diesel for his van through a friend, and took the remaining foreigners who stayed at his house to the airport. Additional flights had been deployed to evacuate foreign tourists out of the country. Purchased food and vegetables from Colombo. We were sick of eating rice and dhal for 3 days, as nothing was available in Hikkaduwa. People are still in a state of a shock. Our phones are not working and there is no electricity. Worse than that, there is no place where we can purchase food and vegetables. Guests staying at Somey’s house are getting impatient, as they have to get back to their countries. Some left for Colombo. The main road from the south to the capital Colombo, along the coast is not motorable, so in land routes have to be used. Pumping fuel to vehicles, is yet another problem. This was the day that disaster struck not only International Diving School, but the whole country. both foreign and local. The two asst. instructors, Dharshana and Ishan were planning to take one group to Kirala Gala and the others to the Conch wreck. By 9 o’clock, everybody started getting ready, preparing their equipment, and were to set off by 9.30. By 9.15, our boss, Somey noticed something unusual about the sea, as the sea level seemed to have risen. There were some children playing on the beach, and Somey shouted his boys to go and bring them up. The sea level was actually rising, and waves were crashing closer and closer towards the diving center. As the first wave rolled inside the center, some started picking up the equipment on the floor and keeping them on racks to prevent them being washed away, but no way, the second wave came instantly, and before anyone could recover themselves in the knee deep water, the third wave crashed in pushing everyone further inside the diving center. Whoever was there, had to swim out and run for their lives, through the Hotel, across the road, and further inside the village. The whole thing took less than a minute. When the sea receded, the diving center crew and a few guests who dared, returned to the scene. Luckily, no one among us was missing, except for a few who were injured in the rush. The diving center was in shambles, its roof collapsed in, and pieces scattered everywhere, most equipment washed away and some buried underneath the debris. What was most astonishing, was the sea. It had retreated further away from the shore about half a kilometer, a sight no Sri Lankan had experienced earlier. The reef, which was about 30 meters away from the beach, was now fully visible. One could see a white smoke rising from the coral reef. Akim, one of our German guests, sensed that something was wrong, and climbed up the hotel balcony and gave us a warning, it might come back. His prediction was correct. In about a half an hour, we could see a thirty foot high, massive black wave rolling towards the shore. Again, everybody bolted. 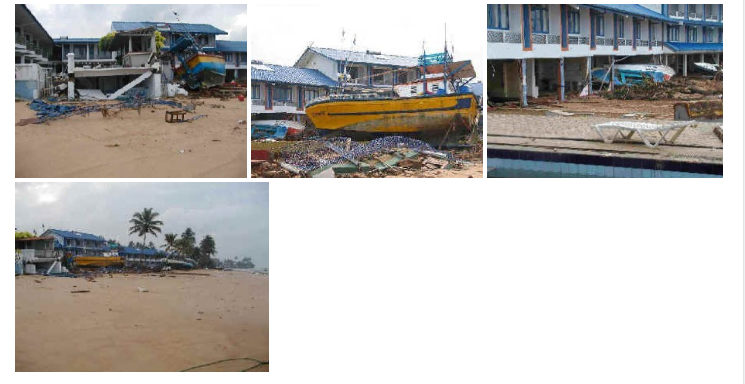 Once the waves receded after causing a bigger damage, the boats which were inside the Hikkaduwa fishing harbour were seen on top of the reef, in front of the hotel. By now, no one knew what to do exactly, except to flee at the sight of the next wave. The third and the final wave hit Hikkaduwa by around 11.30 a.m. causing the biggest damage. It took the fishing boats which were on the reef, further inside and most ended up in front of the hotels, some on the road, and a few were carried past the railway track, which is located some 50 meters away from the main road. As the day passed, both foreign tourists and residents in the area who lost their homes, still not recovered from the shock, gathered in the village temple or nearby houses to spend the night. Villagers brought food and clothing to the stranded people. Somay gave shelter to about 30 guests in his house. It is unlikely that anyone in Hikkaduwa had any sleep that night, as most were expecting another tsunami. Thus ended the day, which Sri Lanka faced her biggest natural disaster, that claimed more than 30,000 lives throughout the country, and left over a million homeless.